Coleman was commissioned as a second lieutenant in the U.S. Air Force in 1983 and began graduate work at the University of Massachusetts. Her research focused on polymer synthesis using the olefin metathesis reaction and polymer surface modification. In 1988, Coleman entered active duty and was assigned to Wright-Patterson Air Force Base. As a research chemist at the Materials Directorate of the Wright Laboratory, she synthesized model compounds for optical applications, such as advanced computers and data storage. Coleman also acted as a surface analysis consultant for the Long Duration Exposure Facility (launched from STS-41C in 1984 and retrieved during STS-32 in 1990). In addition to assigned duties, Coleman was a volunteer test subject for the centrifuge program at the Crew Systems Directorate of the Armstrong Aeromedical Laboratory. She set several endurance and tolerance records during her participation in physiological and new equipment studies. Coleman retired from the Air Force in November 2009. Coleman was selected by NASA in March 1992 and reported to the Johnson Space Center in August 1992. Initially assigned to the Astronaut Office Mission Support Branch and detailed to flight software verification in the Shuttle Avionics Integration Laboratory, Coleman subsequently served as the special assistant to the Center Director, Johnson Space Center. She served in the Astronaut Office Payloads and Habitability Branch, working with experiment designers to ensure that payloads can be operated successfully in the microgravity environment of low Earth orbit. As the lead astronaut for long-term habitability issues, she led the effort to label the Russian segments of the International Space Station in English and also tracked issues, such as acoustics and living accommodations aboard the station. She served as a CAPCOM in mission control for both the space shuttle and space station for a number of years. She represented the astronaut office on the Tile Repair Team for NASA’s Return to Flight after the Columbia accident. Coleman also served as the Chief of Robotics for the Astronaut Office, tasked with overseeing astronaut robotics training and the integration of crew interfaces into new robotics systems. Space Shuttle Training: Coleman served as a mission specialist on STS-73, trained as a backup mission specialist for an injured crewmember on STS-83, and was the lead mission specialist on STS-93 for the deployment of the Chandra X-Ray Observatory. 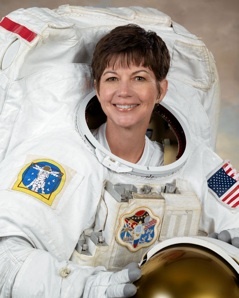 Space Station Training: Coleman acted as the backup U.S. crewmember for Expeditions 19, 20 and 21 and served as a backup crewmember for Expeditions 24 and 25 as part of her training for Expeditions 26 and 27. SPACE FLIGHT EXPERIENCE: Coleman has logged more than 4,330 hours in space aboard the Space Shuttle Columbia and the International Space Station. STS-73 Columbia (October 20 to November 5, 1995) was the second United States Microgravity Laboratory mission. The mission focused on materials science, biotechnology, combustion science, the physics of fluids, and numerous scientific experiments housed in the pressurized Spacelab module. In completing her first space flight, Coleman orbited the Earth 256 times, traveled more than 6 million miles and logged a total of 15 days, 21 hours, 52 minutes and 21 seconds in space. STS-93 Columbia (July 22-27, 1999) was a 5-day mission during which Coleman was the lead mission specialist for the deployment of the Chandra X-Ray Observatory. Designed to conduct comprehensive studies of the universe, the telescope has enabled scientists to study exotic phenomena such as exploding stars, quasars and black holes. Mission duration was 118 hours and 50 minutes. Expedition 26/27 to the International Space Station: On Coleman’s third space mission, she served as a flight engineer aboard the Russian Soyuz TMA-20 spacecraft for launch and landing and spent 159 days in space aboard the International Space Station. In addition to performing science experiments and space station system maintenance operations, she acted as the lead robotics and science officer during her tenure aboard the ISS. Exp 26/27 hosted a record number of visiting vehicles to the ISS: A total of two space shuttle missions (STS-133 and STS-134), three Russian Progress supply ships, the second Automated Transfer Vehicle from the European Space agency “Johannes Keppler” and the second Japanese supply ship “Kounatori.” Notably, Coleman was the lead robotic arm operator for the capture of Kounatori, performing the second-ever free flyer robotic capture aboard the ISS. Expedition 26 launched from Baikonur, Russia, on December 16, 2010, and Expedition 27 landed near Dzhezgazhan, Kazakhstan, on May 24, 2011, after traveling 63,345,600 miles in 2,544 orbits during 159 days in space.